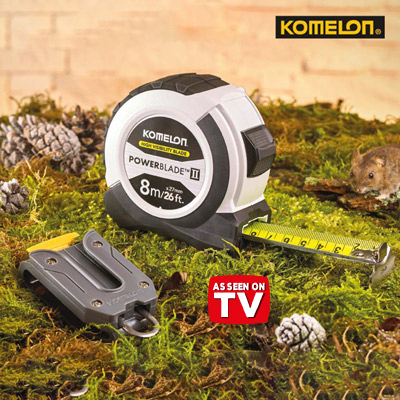 Komelon Powerble II 8m (26ft) Tape. The Komelon 8m PowerBlade Tape has a dura NY nylon coated steel dual printed blade with vertical blade markings on the reverse and patented hi-vis blade printing – EC Class 2 standard. The Dura NY nylon coating offers superior quality that lasts up to 15 times longer than conventional blades, also featuring a double clip end hook and strong blade lock. All contained within a tough, ABS plastic case with protective rubber over mould.